Visitors packed into Northwich on Saturday 25th November as the town hosted the 2017 Christmas Extravaganza. 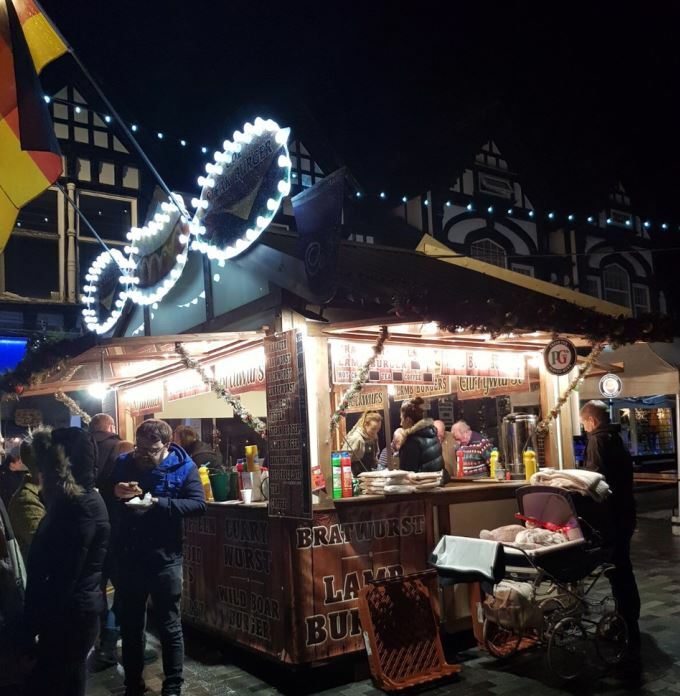 Organised once again in a partnership between the Northwich Town Council (NTC) and Northwich Business Improvement District (BID), there was a real festive feel throughout the town as people enjoyed the wide range of attractions and activities which had been booked. The day climaxed in late afternoon with the light switch-on and a spectacular firework display to send people home full of Christmas cheer, looking forward to the festive season. Proceedings got under way at 10:00am with visitors browsing the unique markets on Witton Street and in Barons Square which were hosted by our own Northwich businesses and local artists, while a Christmas Land Train transported people all around Barons Quay. 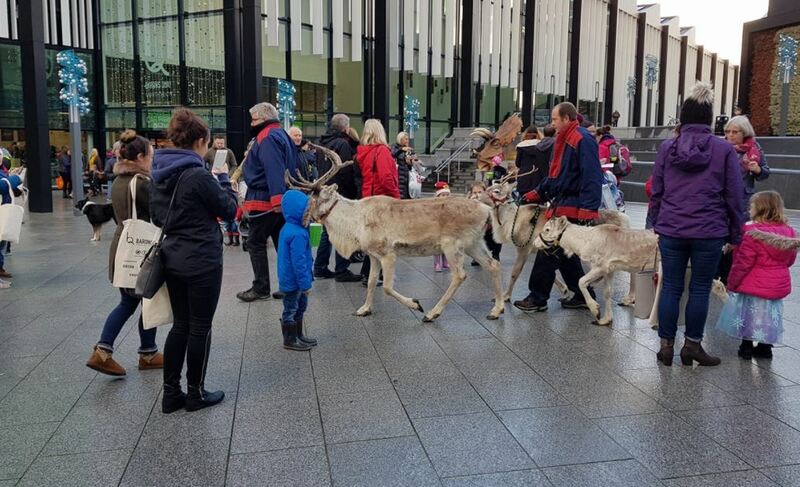 Everyone also enjoyed the animals which came to Northwich for the day as Reindeer, Donkeys, Birds of Prey, Nativity Animals and a Wise Man’s Camel captured the imagination of the crowds, while a T Rex and Triceratops wowed the children in attendance. Kids were also captivated by a number of exciting activities and characters including fairground rides, tractor and trailer rides, a gingerbread man, Christmas Elf and a giant snowman. They also had the chance to meet Father Christmas in Santa’s Grotto and let him know what presents they were hoping to find under the tree this year. Musical entertainment came courtesy of The County High School Leftwich ‘Brassed Off’ band in Weaver Square who were playing Christmas classics, and crowds were entertained by Signal Radio and artists performing live on the Library steps during the afternoon. Further festivities could be found on the High Street and by Brunner Court as Nigel Brown provided Christmas cooking demonstrations opposite the Swinging Witch and visitors got creative at the Arts & Crafts tent which included activities such as gingerbread decorating. Following all of these attractions, the day concluded with the magical children’s lantern parade and Christmas lights switch-on which also saw the Children’s Christmas competition winners’ designs come to life on the front of the library. Mesmeric fireworks then transformed the Northwich night sky as the crowds looked on, to bring the day to a spectacular end. Following the event, visitors took to the Visit Northwich Facebook page in praise of the Extravaganza. Northwich Town Mayor Cllr Janet Myerscough-Illidge believed it was a great day and has praised both NTC and the BID for helping to make it a success. 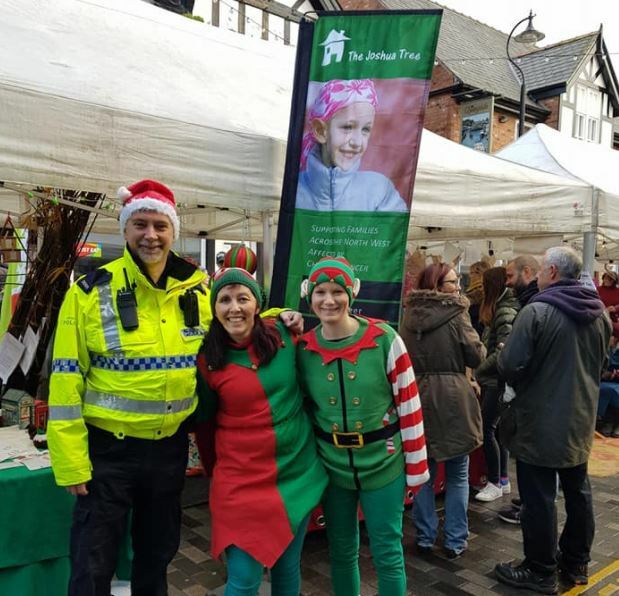 “There were thousands of people in Northwich for the Extravaganza which helped to create a wonderfully festive atmosphere. Chair of the BID, Gaynor Sinar, was in town for the Extravaganza and believes it was the best event yet. “It was the busiest I have seen Northwich for a long time and when I went up onto the stage I simply couldn’t believe the amount of people getting ready to watch the light switch-on and fireworks. For more on the day, make sure you head to the Visit Northwich Facebook page.